Brayden Schenn has nine points in 12 games this season. 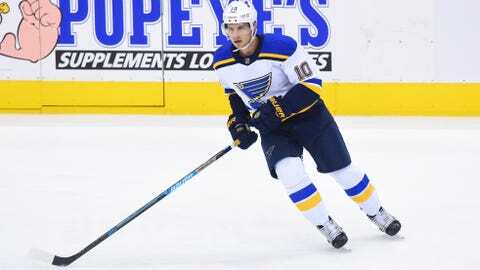 ST. LOUIS – With center Brayden Schenn‘s recovery from an upper-body injury taking longer than hoped, the St. Louis Blues placed the 27-year-old center on injured reserve Thursday. The move is retroactive to Nov. 3. Schenn, who has nine points (three goals, six assists) in 12 games with the Blues this season, has sat out the team’s last four games. Schenn led the Blues with 70 points last season, his first with the club. The Blues filled Schenn’s roster spot by recalling forward Sammy Blais from San Antonio, the club’s AHL affiliate. Blais, 22, has two goals in nine games with the Rampage this season. He also has played in eight games with the Blues. In addition, forward Pat Maroon has an upper-body injury and is returning to St. Louis.